The Arts and Crafts Fireplace . . . A Finely Crafted Fire Space! is as relevant and inspiring today as it was more than a century ago! 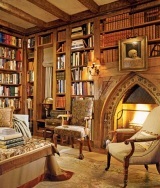 Please click here for a detailed history of the Arts and Crafts Movement. A reaction to Victorian excess, the Movement sought to return to a simpler, more utilitarian style that emphasized originality and handcrafted quality that was in tune with nature, rather than machine-made quan- tity for economy and profit. In Europe -- particularly in Britain -- pro- ponents of the Arts and Crafts Movement looked to the past for inspiration and borrowed design elements from the Middle Ages. The medieval motif in the two brightly-colored tiles flanking the firebox below is typical of the style. The splayed legs and handcrafted detailing shown in the following examples are also typical of the style. Charles Rennie Mackintosh (1868-1928), a Scottish architect and designer, was a leading proponent of the Movement in Britain. The Mackintosh-inspired design with built-in shelving pictured below shows that an Arts and Crafts fireplace can be both functional and decorative. The following two designs are interesting and creative present-day interpretations of the style. 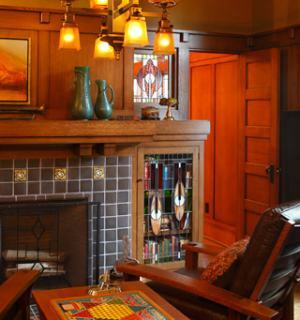 Three of the designs pictured below are faced with reproduction Arts and Crafts ceramic tiles. The fourth design (bottom row at right) has a surround with large natural stone tiles. Another relatively common feature of authentic Arts and Crafts fireplace design is a copper hood or canopy, such as the exquisitely crafted example pictured below, left. A wide range of beautifully designed and crafted fire screens (below right) are also available to complement an Arts and Crafts hearth. Please check back often or subscribe to our RSS feed, as we fre- quently add new designs for Arts and Crafts fireplaces to our site. Hearths...New Twist on an Old Theme!